Holding an end-of-the-year or holiday party at your office brings everyone together for a festive celebration. You might be surprised to learn that some of those expenses may be tax deductible on your business's federal tax returns. If you have questions about what is and what is not tax-deductible contact an accountant in Las Vegas for additional details. If your company gives out employee gifts, it is important to note that the allowable deduction on federal tax returns is $25 per employee per year. If you give your employees a $200 gift card, you can only deduct $25 of that on your federal income tax returns. The cost of the card, envelope, wrapping or shipping of a gift cannot be added to the value of the gift for tax deduction purposes. Many parties include entertainment, such as a comedian, piano player or disc jockey. The IRS allows organizations to deduct 50 percent of the cost of reasonable and ordinary entertainment on federal tax returns. The entertainment must not be lavish, and it must be for employees or associates and not for people with no vested interest in the company or for the general public. 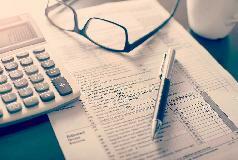 In order to take that tax deduction, the company's owner must be in attendance at the event. Meals served to your employees at a holiday party may also be tax-deductible at a rate of 50 percent. In order to take that deduction, the company owner must also be at the event and partake in the meal. There are no limits on the quantities or types of food served at workplace holiday parties that can be deducted on federal income tax returns. However, the meals should not be what the IRS could subjectively consider as lavish or extravagant. For example, a taco bar is not lavish, but plates of caviar are.